100 minutes, 139 characters, 4 actors, and GO! 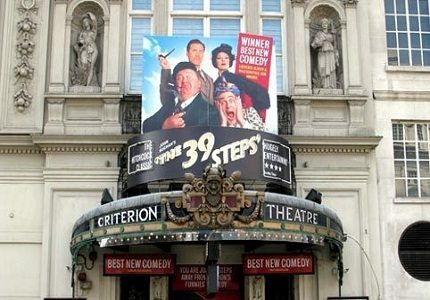 This is essentially the essence behind The 39 Steps, the melodramatic play adapted from Alfred Hitchcock’s 1930’s murderous classic. Set in 1930’s Blighty, the story is the adventure of the painfully British (and painfully handsome) Richard Hannay. 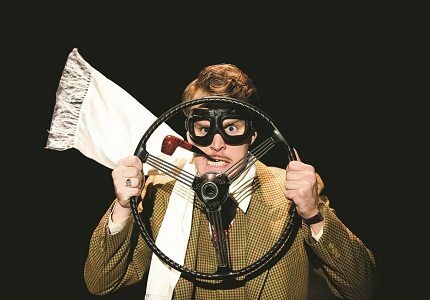 The show ironically opens in a 1930’s London Theatre as Richard Hannay is watching a demonstration of “Mr Memory” – a show of a mans incredible photographic memory. Off stage shots are fired and terror ensues. Hannay finds himself in the clutches of a beautiful woman, Anabella Schmitt, who he ends up taking home with him and who later reveals herself as a spy. Anabella lets Hannay in on a plot she has uncovered called ’39 Steps” and the next day he finds her dead in his flat clutching a map of Scotland. Whimsically disguised as a milkman, Hannay escapes his flat and flees to Scotland. Thus the adventure begins. 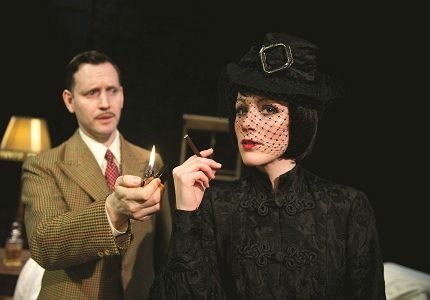 Richard Hannay is like a tongue in cheek 1930’s James Bond as he woos every attractive lady in sight and jumps through windows and onto trains as he tries to escape spies and cunning murderers. The show is fast paced and action packed with many references to the Hitchcock area and his other popular Hollywood films. 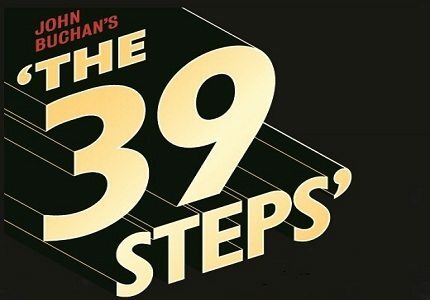 The 39 Steps is a testament to the acting profession as only 4 actors create the entire action packed adventure, with one actor playing the lead role, one female actor embodies all of the plays flirtatious ladies and two other actors create each and every villain, spy, goody and baddie you could think of! All set and scenery is created with the actor’s manipulation in a hail of physical theatre. The show has run on the West End since 2006, and has won a Laurence Olivier Award for Best New Comedy. The show was also a huge success on Broadway, earning itself two Tony Awards overall making the production one of the most successful plays of the 21st Century in both the US and the UK. The show contains references to violence and sexual innuendo, although it does not tend to use bad language and all fighting is presented in a comedic manner. None the less the show is not suitable for young children. Children over the age of 8 may attend the show accompanied by an adult and at their parents discretion. 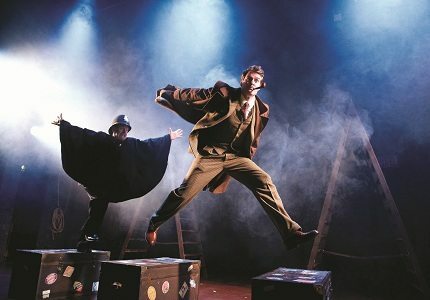 Older children will be wowed by the magic of the stagecraft created on stage and the actors’ abilities to switch characters at the blink of an eye. This show would be good for teenagers studying drama at school.